Do you want to start a business while you work a 9 to 5 ? There are so many articles about people who quit their jobs to start their own business. I’m not trying to throw any shade at the folks who quit their job, but that was definitely not an option for me. I’ve always been super cautious. To the point where sometimes I’m my own worst enemy. I knew that regardless of what magical number folks recommended that you should save up before quitting your job (typically 6 months is what I’ve seen), would NEVER be okay with me. I’m single. I don’t come from a wealthy family. I have no one that I can go to for support in case things don’t work out with my business. Needless to say, if I quit my job and my business failed, I would be in a serious financial hot mess. This was an unnecessary gamble that I was not willing to take. If I end up in a financial hot mess, I want it to be due to circumstances beyond my control (i.e. laid off), not one that could have been avoided (i.e. quitting my job). 1. It’s Time to Launch Your Business Ebook (37-page ebook): This eBook outlines the overall process to start a blog or business (hint: treat your blog like a business). 2. SWOT Analysis Guide: Learn how to determine what type of business you should start. 3. 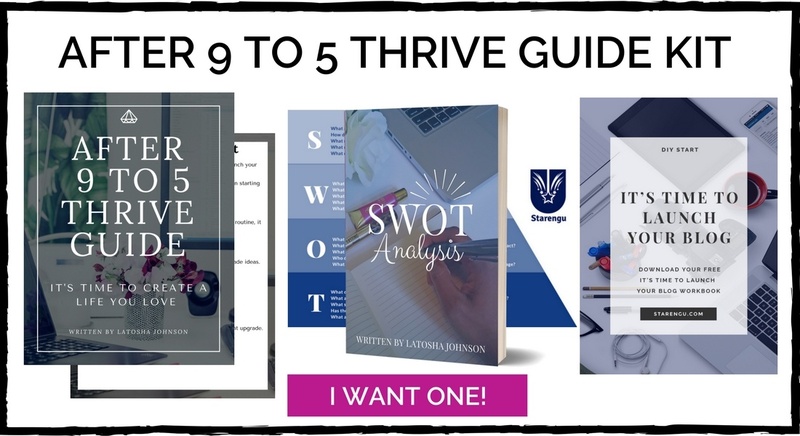 After 9 to 5 Thrive Guide: Discover how to find the tools and time you need to implement a routine to start your business. This kit is going to show you how I made (emphasis on made) time to start a business while I was working my 9 to 5. If I did it, I know you can as well.